What would you do if I told you that a bus dedicated to guacamole was making its way around the country this summer? Would you take your camera out in preparation for some prime IG content, or grab your favorite tortilla chips for a serious snacking session? Either way, get ready — because Wholly Guacamole’s “Guaclandia” bus is traveling the U.S. It’s literally an avocado-themed mobile exhibit that’ll make your Instagram (and snacking) dreams come true. Get hungry, y’all. You read that correctly. A bus dedicated to guacamole is touring select cities throughout summer 2018, and you won’t even have to “pay extra” to see it. 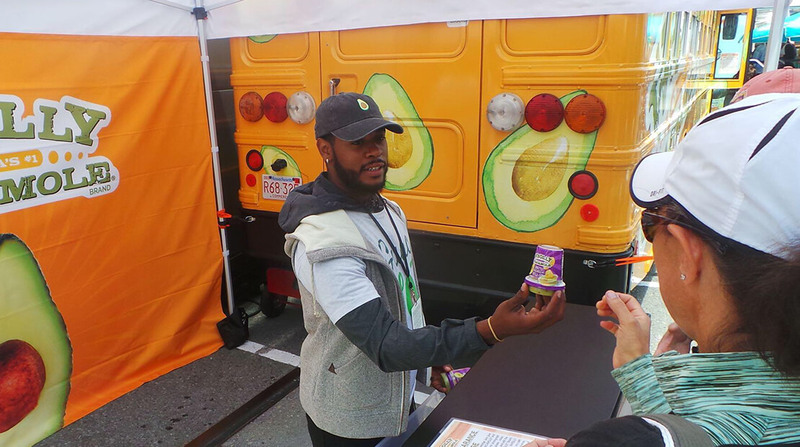 The avocado experience — cleverly called Guaclandia — was created by Wholly Guacamole in effort to promote the company’s new Snack Cups. The Snack Cups will be offered during the bus tour so visitors can try the new flavors, which include Classic, Spicy, and Homestyle. Each container even comes with “crunchy tortilla chips,” so you won’t even have to bring your own. It’s a total win-win. In addition to Wholly Guacamole samples, Guaclandia will also provide guests with photo ops and activities. According to the company’s press release, some activities include sitting in the “pit” of an avocado chair, winning prizes in an avocado-inspired arcade, and taking selfies at a “pop-art style” avocado wall. Plus, a jumbo ball pit will be waiting for visitors when they’re done with the experience (they’ll have to slide into it on their way out). TBH, I couldn’t agree more. Bring on the guac.